We previously showed you guys how to update to iOS 7 and also how to downgrade from iOS 7. Now it is time to do a brief iOS 7 tour and show you some of the new functionality that was talked about during the WWDC 2013. There is 12 major areas that Apple touched in iOS 7, and also a ton of other smaller features that are worth noting. Let’s first cover the lockscreen. The lockscreen will immediately jump out to you as being completely different, although the core functionality is still the same, it really provides a different experience. There is no slide to unlock button anymore for one. 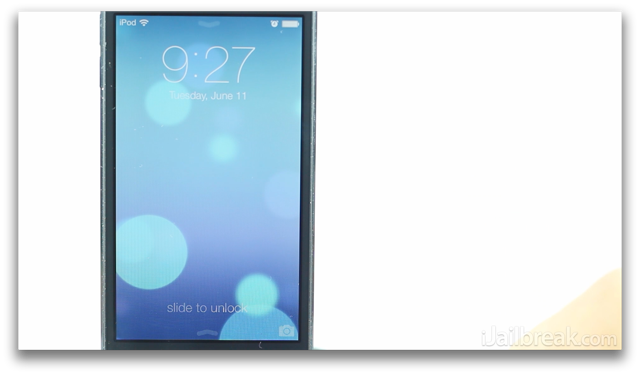 You simply swipe to the right anywhere on the screen and your device will unlock itself. There is still the camera grabber, that can be accessed by swiping up. 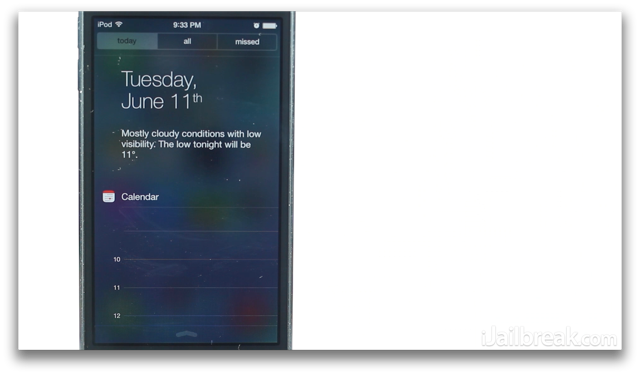 You can also bring down the Notification center directly from the lockscreen in iOS 7; as well as the control center, which we will cover in further detail shortly. When you have a Passcode enabled the lockscreen maintains its new style and looks stunning! Moving right along to the home screen you will instantly notice all of the icons are different. They are flatter and obviously more colourful. One new feature I want to bring to your attention right now is that the home screen uses the accelerometer to adapt the screen in parallax, achieving depth or a 3D-like effect. Next up you will be pleased to know that both the time and weather application icons actually change dynamically. You can notice it right now with the seconds hand on the clock. While on the subject of icons, folders now work slightly differently. There is a new animation when entering and exiting folders and folders have pages! That means you can place hundreds of apps in folders. Even the Newsstand can be placed in a folder now. The spotlight is no longer its own page, it can instead be accessed from anywhere on the home screen by swiping down from the middle of the screen. It works and functions the same way. The Notification Center is much improved with better widgets and the ability to see only notifications for today, all notifications or missed notifications by tapping the tabs at the top. There is more options that are configurable in the Settings app such as whether or not you want it to be enabled on the lockscreen. 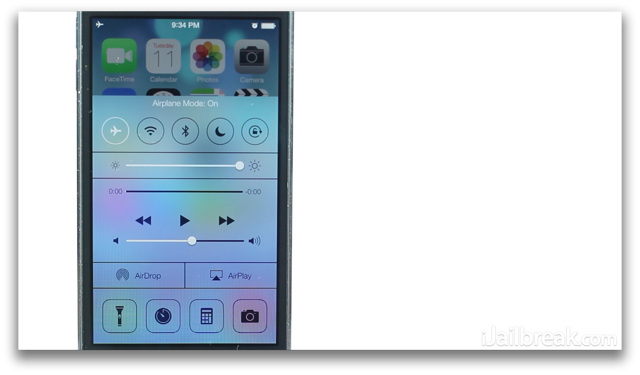 One of the more exciting features of iOS 7 is the Control Center. 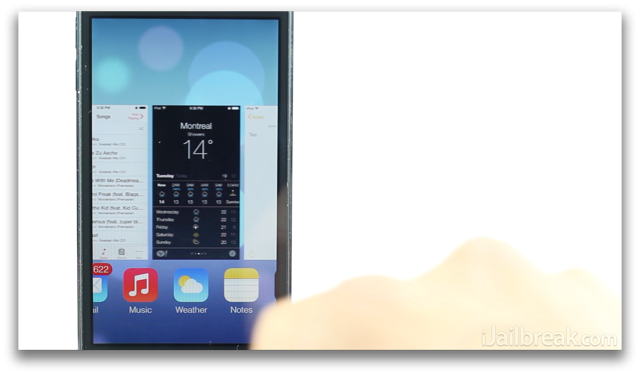 If you swipe up from the very bottom of the screen from within anywhere in iOS you will bring up the Control Center. It has toggles for frequently accessed settings like AirPlane Mode, WiFi and Bluetooth along with a brightness slider, music controls, AirDrop and AirPlay shortcuts and other app shortcuts. There is even flashlight functionality! The Control Center really answers users cry for a quick way to access settings that are frequently turned on and off. Right now it is not possible to customize the Control Center, but in a future beta version this might change. The only thing you can adjust right now is whether you want it to be accessible from the lockscreen. 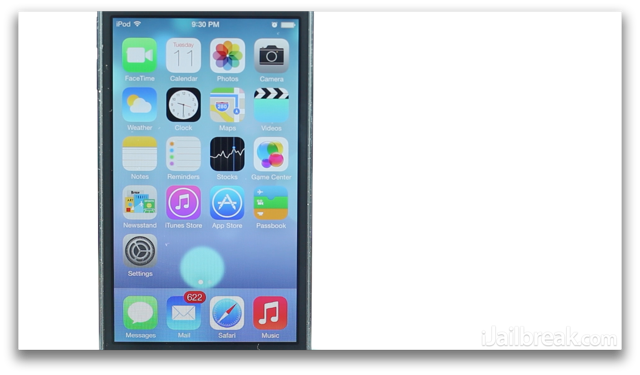 Another exciting modification to iOS 7 is the multitasking switcher. Apps are presented in Web-OS like cards with a preview of where you left off in the app and the apps icon shown underneath. You can remove apps by swiping up and cycle through them by swiping left or right. 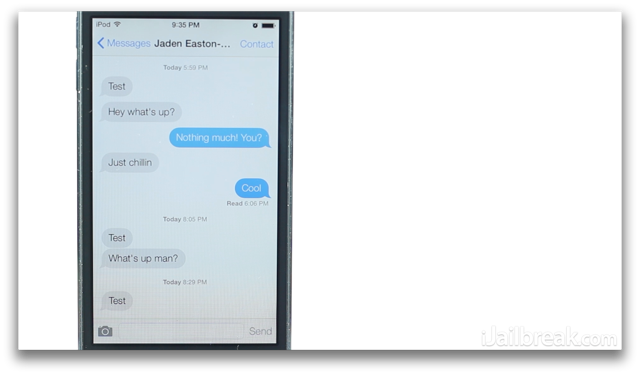 Unfortunately there is no in-app replying functionality yet, but the Messages app has changed visually. There is also new features like the ability to blacklist certain contacts. The notification banners have changed also. The Mail app in iOS 7 has been simplified and slightly re-designed. You can now swipe from the side of the screen to get to email folders, text has been refined and photos now reach the edges of the screen. The Calendar app is much more simplified and there is no more textures. 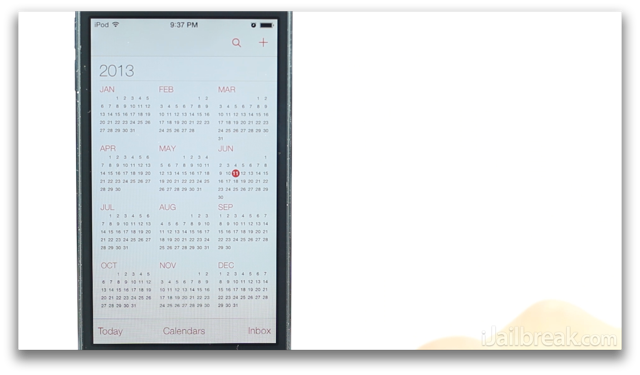 Other apps that have been simplified include the Calendar app. Clock app, Notes app, Compass, Calculator app, App Store etc. Safari has gotten a fresh coat of paint in iOS 7 and some powerful new features. The URL and search box has been unified into an Omnibar for search and there is also unlimited tabs. The Camera app was actually significantly altered by Apple giving users new camera modes that can be switched between that include Video, Photos, Square Photos and Panoramas. There is even built-in filters! On the topic of Photos the Photos app has seen much improvement in iOS 7. Photos are now organized based on date and location and it’s much easier to navigate thanks to a ton of filtering options. There is even iCloud Photo Sharing. It is safe to say that every stock application has been touched by Apple in some way in iOS 7 to make the experience consistent across the mobile operating system. 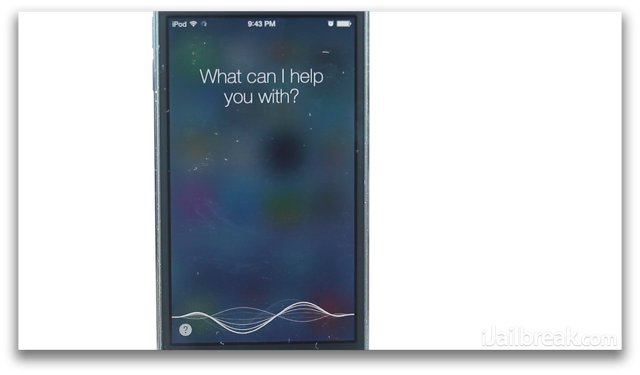 Siri in iOS 7 looks completely different and there is two new voices: both a new male and female voice. There is also new Siri functionality like the ability to toggle certain iOS functions like Bluetooth and search Wikipedia, Bing and Twitter. Some other features worth noting include iCloud keychain that saves and aggregates your passwords, FaceTime audio calls (essentially built in VOIP calling), an Inclinometer in the Compass app, Flickr and Vimeo integration, Notification Sync , iOS In-Car that makes iOS more interactive with your car and walking directions in the Maps app. I hope this walkthrough of iOS 7 has given you a good idea at just how much of a vast improvement it will be. iOS 7 will be compatible with the iPhone 4, iPhone 4S, iPhone 5, 5th generation iPod Touch, iPad 2, iPad with Retina Display and iPad Mini. It will be released to the public in Fall 2013. So, is iOS 7 a failure, or Apple’s biggest success? I would most definitely say it will go on to be Apple’s biggest success. Although there is some criticism on Apple’s design of iOS 7, actually using the new OS is 10x better than previous generations and besides in-app messaging replies, almost every feature users have been longing for was implemented. Let us know what you think of iOS 7 in the comments section below. Are you a fan? does the parallax thing work with iPhone 4? No, Cameron, the parallax is not supported on iPhone 4. I just worked this one out myself. Where is the new ipad (3rd gen) !? Or ipad with retina display means the both ipads 3rd gen and 4th gen ? To whoever wrote the headline to this article: Are you fucked in the head? No, it will be the death of the remaining cells of your brain ! Sounds just as silly, no? I’ve searched all around and cannot find how this iOS 7 will look on the iPad. Can someone who has this iOS on their iPad upload an video showing it? Thanks in advance. Well that headline is completely ridiculous. You need an editor running this thing, really. so wait, how is this article title relevant to the content? misleading title. Haha considering iOS 7 will inevitably determine the fate of Apple I think the title fit fine with the review. I have changed it though to be more relevant to the content of the review. It’s not available for iPad yet, that’s why. It’s Beta 1 software. It’s a little early to be predicting the end of Apple yet again based on a product that isn’t even ready for prime time yet. I’d say his question was sound. With the new control center will happen to zephyr? What was the original title again? Its pretty cool. Definite improvement and also seems to help with battery life to a degree. How could I forget this? In Ios7, all of your email accounts are commingled together and cannot be separated. Productivity at work should go way down as everyone wades through the Facebook updates, junk mail, jokes, and personal stuff surrounding work email. Am I the only person with three email addresses, one for social media, one for family friends and shopping, and the third for business? The only redeeming quality in this update was the improvement in control center functionality.